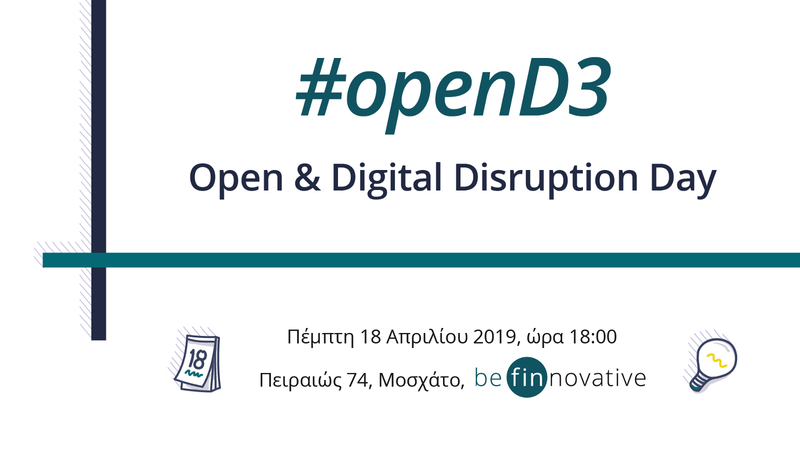 #openD3 will feature a presentation and discussion on a wide range of emerging technologies and tools leading to the development of new business models, new businesses and services in the field of fintech. In addition, we will be discussing digital trends that have a catalytic effect on important sectors of the economy and digital transformation processes of organizations and enterprises. Anyone interested in the new trends and potential of the new digital economy through the use of disruptive technologies. Businesses, teams and startups with ideas, solutions and services related to fintech. Anyone interested in utilizing the results and meeting the teams of the be finnovative innovation lab. Prevailing technology trends of recent years, such as Artificial Intelligence (AI) and Blockchain. The new institutional framework PSD2 / GDPR, the opportunities and challenges created through the API economy. The course of the be finnovative program so far and next steps. The program of the event will be available soon.